I have fond childhood memories of my mother going to Taco Time and coming back with crispy burritos for my brother, sister and I. Long and crispy and wrapped in that crispy paper bag with unsealed open ends on both sides…I can hear myself crunching into it now. Recently I find myself wanting to snack on such tasty Tex-Mex treats and even pass on the tradition to my daughter. But alas, in Malaysia, Mexican fast food joints are not so common. Best to try my hand at making a crispy bean burrito at home. It’s fairly easy to throw together: puree the beans with the spices, stir in the cheese, wrap in a tortilla and toast. Voila! 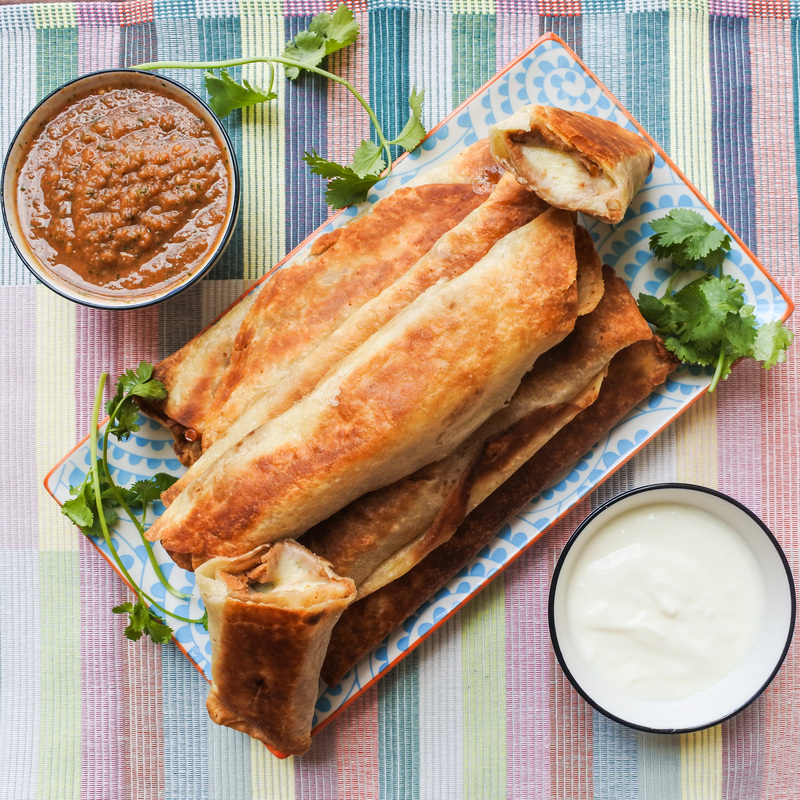 Crispy, cheesy burritos galore! These are perfect as a snack, party food, or even a meal for both adults and kids. Make ahead of time and freeze like me, or cook it all up at once-the choice is yours. Serve with your favorite dipping sauces and you’re set! Rinse and drain beans and put either in a mixing bowl or food processor. Add olive oil, lemon juice, salt and spices. Puree until smooth via a food processor or handblender. When tortillas are warm and malleable, place 1/4 cup of mixture along the center. Lift one side of the tortilla and roll it up, making sure to tuck the end in under the mixture. Continue until you have a tight roll up. In a large frying pan, add 2-3 tbsp of oil and heat on medium/medium high flame. Add burritos (flap side down) and fry until lightly brown on both sides (about 1-2 minutes on each side). Place on an oven tray and toast in the oven at 220C/450F for 5-7 minutes until everything is golden brown and crispy. Serve with your favorite salsa, guacamole, sour cream and hot sauce. Enjoy! You can roll these up ahead of time and freeze them (just don’t toast them). When ready to eat, take out, pan fry on both sides and pop in the oven. Bean and Cheese Crispy Burritos. Add olive oil, lemon juice, salt and spices. Puree until smooth via a food processor or hand blender. Warm tortillas in oven. When tortillas are warm and malleable, Place 1/4 cup of mixture along the center. Lift one side of the tortilla and roll it up, making sure to tuck the end in under the mixture. Continue until you have a tight roll up. Repeat with remaining tortillas and bean and cheese mixture. In a large frying pan, add 2-3 tbsp of oil and heat on medium/medium high flame. Add burritos (flap side down) and fry until lightly brown on both sides (about 1-2 minutes on each side).